The Beretta Nano is the ultimate evolution of the micro compact carry pistol. Utilizing a removable, serialized sub-chassis the Nano pistol can be easily modified with replaceable grip frames and is simple to disassemble and maintain. Ease of use and concealment were key drivers in the development of the Nano. The Nanos extremely low profile, snag free design makes it easy to carry and draw from concealment. To accommodate right or left-handed use, the Nanos magazine release button can be easily reversed. The light, durable, frame employs modern thermoplastic technology through the use of fiberglass reinforced technopolymer. The Nanos sights are user adjustable with a 1.3mm hexwrench and your fingers. This allows anyone to adjust their sights without the assistance of a gunsmith. Modular structure, ergonomics and ease of use make the Beretta Nano the ideal firearm for concealed carry. Do you have to use 9mm Nano ammo in this gun? BEST ANSWER: You need a gun with a safety if your asking that question. I agree with “Don’t laugh a lot”, “Hope Joke” & especially “Best Answer”! He who asked that question needs an intense safety course, also! As a Female USN Veteran, raised my children with Beretta’s! My daughter was a sharpshooter at 12! Now her daughter is at 13! Handing down my Beretta is a “Right of Passage”! Needs a gun that squirts water, as it is nanoo, nanoo! Does the Beretta Nano 9mm pistol have a safety button? BEST ANSWER: Nothing external except a mag release. No safety or slide release. All the info regarding the weapon is available on the beretta website. Research any weapon before you purchase it. You need to I now what you are buying to defend you or your family with. The Beretta Nano features a integrated safety built into the trigger, but does not have a external switch safety like Beretta's M9 for example. It does not have a safety button just safety on trigger. When you say it has a safety on trigger what do you mean by that? No, just the typical strike fired internal ones. No, the Beretta Nano has no safety. It does not have a safety button. How many magazines does the nano come with? John posted below that he got a rebate when he purchased this gun back in December, 2017. Does anyone know if that rebate still applies? I assume it's a rebate directly from Beretta. BEST ANSWER: No that rebate has ended. How many clips comes with it? BEST ANSWER: It doesn’t come with clips. It comes with magazines. And it comes with 2. Mine came with 2. An 8 round and a 6 round. I bought a grip extension for the 6 round and it is my carry gun. 2 clips included. One is an extended 8 round and the other is a standard 6 round. My hands are big and I prefer the extended mag because the clip is extended by 1”. There is a factory Barretta mag extension kit that I used to modify my 6 round mag. They are magazine not clips. The Beretta Nano comes with 2 magazines. One is a 6 round magazine that is flush, as shown in the picture, and the other is an 8 round magazine that is extended slightly. It comes with one standard 6 round magazine and one 8 round extended magazine. It came with an 8 round mag and a seven round mag. Not a Garand nano, mags not clip. Push-up time. Two, a 6 round and an 8 round. Is this semi auto a better comfort fit for a big hand than the Ruger LCP? BEST ANSWER: Yes. Totally different but yes. LCPis for deep conceal in 380 ACP. This is a 9mm for Every Day Carry. Not as easy to conceal but not anyware as difficult as others. With the extended mag absolutely. When I purchase, where does it get sent for pick-up? Has the ammo that this gun uses been approved by NANO? BEST ANSWER: The pistol can take any 9mm round. Shoots any ammo I put in the mag and is easily concealed. A lot of pluses but one big minis....trigger is AWFUL! Super long and weighty pull. Not a fan of this pistol, and I’ve always liked the Beretta brand in general for making some fine firearms. Pluses are as expected it’ll feed any ammo you wanna shoot. Ultra small and slick for concealed carry. I would rather carry my Ruger LC9S or Smith M&P shield than this one though. Very nice and comfort to carry or council. Overall a good carry gun. Nice carry gun. Put around 300 rounds through her, with absolutely no issues. It has ate hollow points as well as aluminum case and steel case. Trigger is a little gritty and a very hard pull. Polish job helped a lot with the gritty pull. Gun shoots good and seems to be very reliable. Overall a good carry gun. Nice and slim very easy to conceal. Nothing to snag on your pull. Great shooting cc and fun range gun. Bought 1 a couple of years back, now I am looking for 1 for my daughter and 1 for the wife. I bought the Alien Gear tuck free holster. I can feed my gun any ammo I can find, but mostly reloaded. I bought one of these for $300. 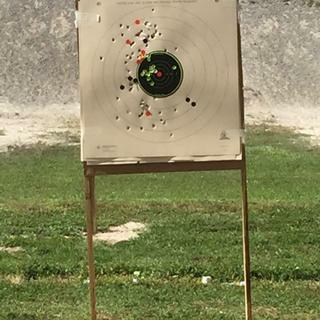 It was nice and seemed to fit the bill of a great CCW. Purchased an IWB Foxx holster for it and thought I was ready to take it to the range and try it out. I brought several different types of ammo with my (Win white box 115gr, Win white box 124, Federal range, and Hydroshocks). I'm a bit OCD when it comes to gun "hygiene", and it was freshly cleaned and lubed. No matter what type of ammo I loaded, it always jammed (FTE). I'm not a novice by any means, but it just wouldn't work. I took it home, and listed it for sale. For the same price point, get a S&W Shield. I have 2 Shields (Thanks for the deals, Palmetto! ), Ruger LC9s, and a Glock 42 & 43. All 4 of which are in my current EDC collection. Save your money and the headache. Nice small easy to use pistol. Excellent for the price. I bought this Beretta Nano after doing some reading about it, including a review by a woman sportswriter who thought it was a good weapon for a woman. The rebate clinched it for me. PSA shipped it in record time, and my FFL showed me how to disassemble it and clean it. I was amazed at how simple it is to take apart. I came home and promptly shot 100 rounds through it. No recoil to speak of. I think it is a perfect gun for a woman. Fits perfectly in my hand using the 6 or the 8 mag. The slide is easier to pull back than my Glock 42. I have no problems with the trigger pull....it seems fine to me. I am thrilled with this purchase! I expected a better product. It is clunky and hard to hold comfortably. Not particularly accurate. Cool little pistol for personal carry but very hard to shoot.. Very long trigger much like a double action revolver. I would not buy again or recommend. Excellent deal. I am very happy with my purchase. PSA sale with rebate applied was $199. Worth every penny! This gun will get the job done (safety/concealed carry). Not as little as the smaller.380's. The Nano packs alot of power it will surprise you. Simple but effective. Take down for cleaning and lunricating is very simple. Reliability: I shot it right out of the box without any lubricating and did have a couple of jams. After that I took it home cleaned it lubed it and never again had a problem. Buy the 8 round mags you won't regret it. And just for looks I added the laser max needless to say it look amazing. Let's face it. There are "better" single stack guns on the market in terms of trigger pull bore axis and aftermarket support. But if you can get passed the long heavy trigger and full release reset. You'll find this pistol is extremely low recoiling for it's size and quite accurate to boot. I find it odd that the sights are easier to remove and replace than the grip frames. But it's not impossible. And for being only 5'7" and weighing 155 pounds this pistol fits in my pocket quite well (even with a good pocket holster). Definitely not a "go to war" gun.... But it's still a "get home safe" gun. Great carry and conceal gun I never leave home without it and will buy another one at this price.